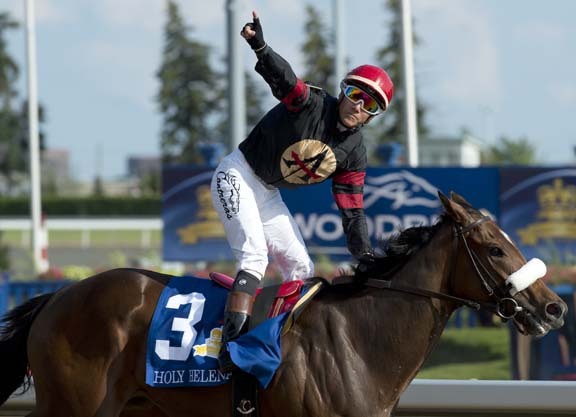 Stronach Stables’ Holy Helena (Ghostzapper) became the seventh filly to complete the Woodbine Oaks/Queen’s Plate double with an effortless score over the boys in the 158th renewal of the Canadian Classic Sunday in Ontario. The filly was the fourth Queen’s Plate winner for Stronach, following most recently 2015 winner Shaman Ghost, who is also by the stable’s 2004 GI Breeders’ Cup Classic winner Ghostzapper. Ghostzapper, in turn, is a son of Stronach’s 1997 Queen’s Plate winner and 1998 GI Breeders’ Cup Classic winner Awesome Again. Holy Helena is a third generation for Stronach’s Adena Springs, making the result even more gratifying for the Austrian-born owner. Holy Helena, sent off the 2-1 Queen’s Plate favorite, had a slight stutter step at the break, but recovered quickly and had the lead in the early strides. She ceded her advantage going under the wire for the first time and settled into a stalking position as State of Honor (To Honor and Serve) took the field through fractions of :24.17, :48.67 and 1:13.23. Holy Helena loomed a threat while rallying three wide on the far turn and, while Megagray (Langfuhr) took over from State of Honor at the top of the stretch, his advantage was short-lived as Holy Helena stormed to the lead and soared clear for a four-length victory. Holy Helena, a debut second sprinting 6 1/2 furlongs at Aqueduct Apr. 15, graduated with a hard-fought 3/4-length tally when stretched to 1 1/16 miles at Belmont May 12. She earned a start in the Queen’s Plate with an authoritative one-length victory in the June 11 Woodbine Oaks. Max this year. Her Fort Larned 2-year-old filly Holy Fort has been working regularly at Keeneland for trainer Ian Wilkes. Holy Grace RNA’d with Holy Helena in utero for $175,000 at the 2013 Keeneland November sale. Frank Stronach also campaigned the winner’s second dam My Marchesa, who captured the 1993 Gala Lil S. at Pimlico. QUEEN’S PLATE S., C$1,000,000, WO, 7-2, (C), 3yo, 1 1/4m (AWT), 2:02.87, ft.
2–Tiz a Slam, 126, c, 3, Tiznow–Flaming Rose, by Grand Slam. 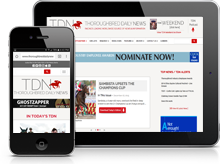 O/B-Chiefswood Stable (ON); T-Roger L. Attfield. C$200,000. Stables, Inc. & William H. Lawrence; B-Anderson Farms Ont. Inc. (ON); T-Chad C. Brown. C$100,000. Margins: 3HF, 1 3/4, HF. Odds: 2.15, 8.55, 7.45. Also Ran: Channel Maker, Megagray, Spirit of Caledon, King and His Court, State of Honor, Aurora Way, Guy Caballero, Malibu Secret, Watch Me Strut, Vaughan.